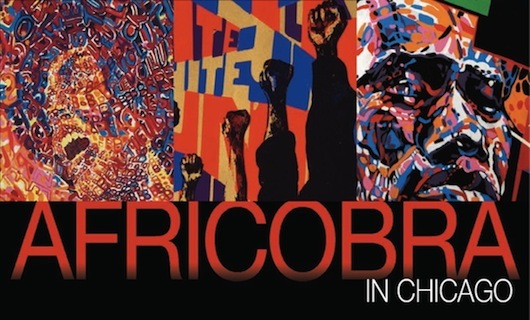 AFRICOBRA in Chicago is a linked series of exhibitions and public programs scheduled May–September 2013 focusing on the Chicago artist group AFRICOBRA (African Commune Of Bad Relevant Artists), founded in 1968 and still active. The founding members, Jeff Donaldson, Jae Jarrell, Wadsworth Jarrell, Barbara Jones-Hogu, and Gerald Williams, came together in 1968 on the South Side of Chicago and had a lasting impact on peers and subsequent generations. This project examines AFRICOBRA’s broader contexts, its history, and its immediate and continuing impact on contemporary art and culture. It will also create opportunities for educational engagement with the collective’s work and philosophy. AFRICOBRA in Chicago is co-presented by three South Side institutions: The South Side Community Art Center, the Reva and David Logan Center for the Arts at the University of Chicago, and The DuSable Museum of African American History. Find details and dates above and below. A jointly published website, dedicated to the exhibitions, programs, and research, will launch in May 2013 and will see continued development through the run of the exhibitions. In the spirit of AFRICOBRA’s philosophy, which emphasized educational values and a group ethos (“to transcend the ‘I’ or ‘me’ for the ‘us’ or ‘we’”), three South Side institutions have come together in collaboration. Intense periods of adult and youth programming will coincide with the short overlap between each exhibition closing and the next opening. AFRICOBRA: Prologue – The 1960s and the Black Arts Movement. This opening exhibition at the South Side Community Art Center (May 10–July 7, 2013), curated by University of Chicago students, will draw on SSCAC’s permanent collection to present a broader context for AFRICOBRA’s years of formation, documenting political issues and artistic developments. It provides historical background and contemporary context for the other exhibitions and will launch a series of programs that will continue at the other venues. It will also afford the SSCAC the opportunity to present recent research and conservation work on its collection. Artists include Sherman Beck, Sylvester Britton, Margaret Burroughs, Elizabeth Catlett, Bernard Goss, Barbara Jones-Hogu, Roy Lewis, William McBride, Archibald Motley, Alonzo Parham, John Sibley, Frank Smith, Douglas Williams, Jose Williams, and Charles White, among others to be announced. The exhibition at the Reva and David Logan Center for the Arts (June 28–August 11, 2013), curated by Rebecca Zorach, a professor in the Department of Art History at the University of Chicago, who is also guiding the student-driven curatorial framework of the SSCAC exhibition, is designed to highlight the aesthetic philosophy of AFRICOBRA first articulated in statements and exhibition text in the late 1960s and early 1970s. The exhibition in the Logan Center Gallery will demonstrate how the AFRICOBRA philosophy was collaboratively developed by the five founding members, through a presentation of key early works and selected current works, raising the question of how founding principles continue to inform each artist. The exhibition also features selected works by three additional members (Napoleon Jones-Henderson, Carolyn Lawrence and Nelson Stevens), who joined shortly after the inception of AFRICOBRA. Themes to be addressed include the revolutionary politics of the period, the project of bringing art to the people through a range of media, and the relationship of gender roles and family to the political context of the time. Artists include Jeff Donaldson, Jae Jarrell, Wadsworth Jarrell, Napoleon Jones-Henderson, Barbara Jones-Hogu, Carolyn Lawrence, Nelson Stevens, Gerald Williams. The exhibition at the DuSable Museum (July 26–September 29, 2013), is curated by Arlene Turner Crawford, visual artist, with Charles Bethea, Chief Operating Officer and Curator of DuSable. This chapter will document how AFRICOBRA flourished and influenced other artists in Chicago—artists who became official members of the group, and other artists who exhibited work in AFRICOBRA shows. In addition to founding members, these artists include Napoleon Jones-Henderson, Nelson Stevens, Carolyn Lawrence, Frank Smith, Murry DePillars, Sherman Beck and Omar Lama. The exhibition will assert the major impact of AFRICOBRA on the visual arts in Chicago, particularly on the South Side, in the period of the Black Arts Movement. AFRICOBRA artists committed themselves to the principles of social responsibility, artistic excellence, local artistic involvement and the promotion of pride in Black self-identity. The works selected for this exhibition will highlight the continuing development of “positive images,” focusing on AFRICOBRA’s aesthetic vocabulary and pursuing its key themes of self-determination, African heritage and solidarity, as well as the inspiration of music on the visual arts. Artists include Sherman Beck, Dorothy Carter, Kevin Cole, Adgar Cowens, Murray DePillars, Jeff Donaldson, Jae Jarrell, Wadsworth Jarrell, Napoleon Jones-Henderson, Barbara Jones-Hogu, Omar Lama, Carolyn Lawrence, Dayo Laoye, Turtel Onli, James Phillips, Frank Smith, Nelson Stevens, Raymond Thomas, A. Turner-Crawford, and Gerald Williams, among others to be announced. Major support has been provided by the Terra Foundation for American Art, an organization dedicated to fostering exploration, understanding, and enjoyment of the visual arts of the United States for national and international audiences. To further cross-cultural dialogue on American art, the Terra Foundation supports and collaborates on innovative exhibitions, research, and educational programs. Additional support for the South Side Community Art Center portion of the project has been provided by the Chicago Community Trust. Additional support has also been provided by the University of Chicago Arts Council.